Standing 5ft 9ins and weighing 67kg, it’s probably fair to say I was never cut out to be the next Sir Steve Redgrave. However, as a growing number of runners are finding out, you don’t have to be a veritable Goliath to reap the cross-training benefits of dipping your oar in. In fact, you don’t even need an oar. It’s much easier to just jump on a Concept2 rowing machine, which is what I’m doing today at the company’s Nottingham headquarters. Search the Internet and there are a million and one quotes about running. But none ring truer than the great Juma Ikangaa, winner of the 1989 New York Marathon, who said: “ e will to win means nothing without the will to prepare.” As runners, we know the importance of training. And yet very few of us ever get it right. Too much here, too little there, not quick enough, not slow enough, not enough hills, too many hills – the list is endless. And confusing. At Men’s Running, we’ve always focused on bringing you great training advice from people who really know what they’re talking about. Whether it’s preparing for a marathon, sharpening up over 5K or adding variety in to your programme, we’ve brought you the best advice from some of the best coaches. 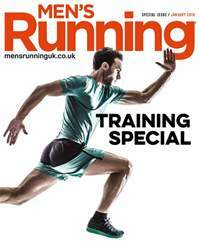 So we thought what better way to celebrate than creating this unique training special, packed full of hints, tips, advice and motivation to take your running to the next level – whatever that might be. We hope there’s something here for everybody. And remember, fail to prepare, prepare to fail. We’re not quite sure who said that, but somehow it seems like good advice!